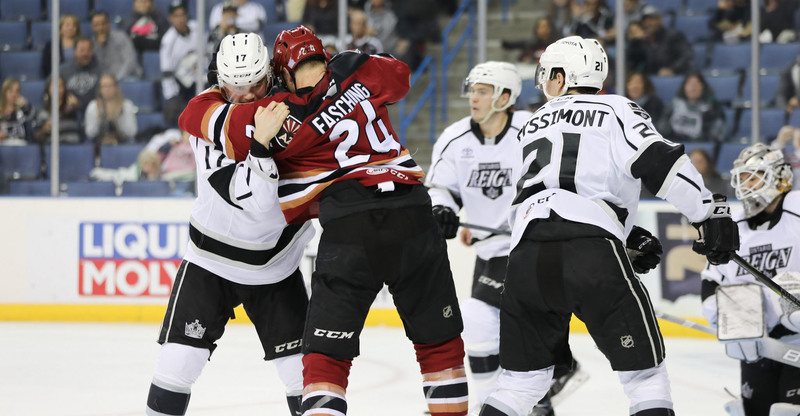 Despite clear-cut signs of resiliency and solid proof of rebuttal, the Roadrunners fell short to the Ontario Reign in overtime for the second straight game, this time by a 5-4 final Sunday evening at Citizens Business Bank Arena. 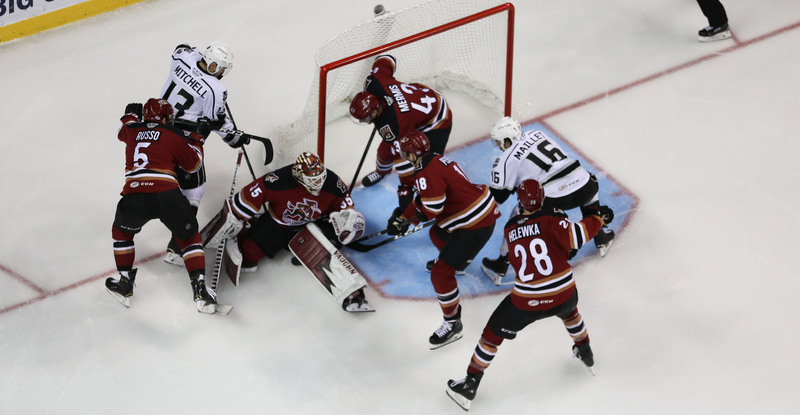 Fresh off their longest hiatus of the season from live game play, the Roadrunners didn’t show many glaring signs of rust; in fact, they outshot the Reign by a 13-9 margin in the opening period and netted the contest’s first goal. That opening tally came off the stick of Michael Bunting, who while stationed atop Peter Budaj’s crease as the Roadrunners operated on their second power play of the night, pounded a loose rebound from a Conor Garland shot into the net to register his sixth goal of the campaign, giving Tucson a 1-0 lead with 7:25 remaining in the first frame. The Reign would respond in the waning seconds of the first, tying the game 1-1 before rattling off two more goals in an 18-second span just past the midway point of the second period to take a 3-1 lead. Clawing back, Kyle Capobianco buried his first goal of the season in attractive fashion, dropping to a knee to snap home a perfectly placed Brayden Burke pass into the net to get the Roadrunners back to within a goal with 2:26 left in the second. With the assist, Burke extended his point streak to three games (3G, 2A). The Roadrunners, down 3-2 at second period’s end, found themselves trailing entering the final frame for just the third time all season. With just over 10 minutes left to play in regulation, Conor Garland deposited a shot from just below the right dot to tie the game 3-3. Garland’s goal, his eighth of the year, matched his single-season career high, which he set in 55 games during the 2017-18 campaign. He has reached the eight goal mark in 18 games this year. Ontario reclaimed a lead 47 seconds later, going up by a 4-3 count until Hudson Fasching delivered yet another game-tying goal for the Roadrunners when he finished a two-on-on sequence with Tyler Steenbergen, shoveling home a back-door feed to score his sixth of the season. Fasching’s goal tied the game, 4-4, with 5:18 to play. Neither team would score again in regulation, the Roadrunners going to overtime for the fifth time this season. Ontario’s Phillipe Maillet scored the game-winning goal 58 seconds into the extra frame. The Roadrunners are now 2-2 in overtime this season, with one having extended to a shootout. Hunter Miska stopped 32 of the 37 shots he faced. The Roadrunners will put a cap on their four-game road trip Wednesday night when they take on the San Diego Gulls at the Valley View Casino Center, where the puck is scheduled to drop just after 8:00 PM MST.